Last year I took several online classes about art licensing and started to feel like it was a part of my business that I really wanted to focus on. All of these classes mentioned trade shows as one way to get your work out there and meet new clients. 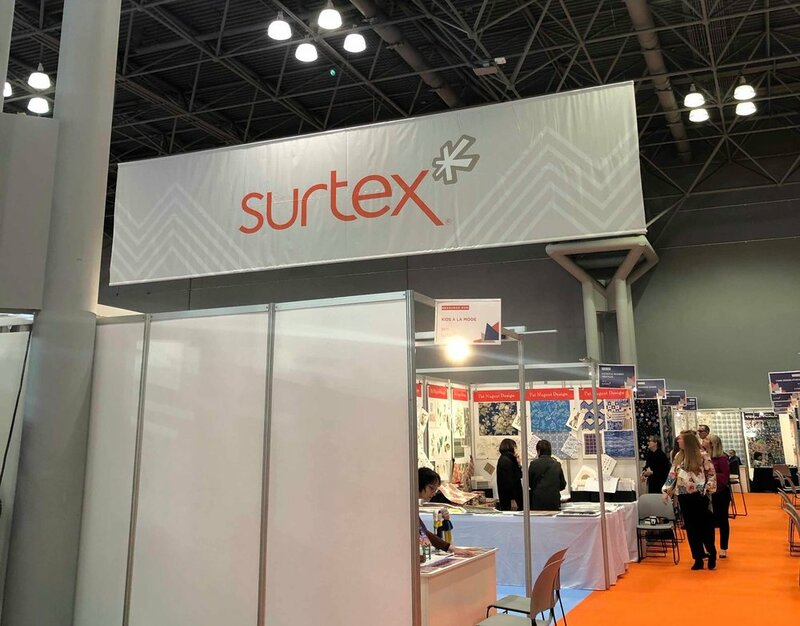 Surtex seemed to be the one that stood out as the best show for those wanting to license their art vs. selling their art outright (my understanding is that Blueprint and Printsource may be better for that, but I’m still not clear on that). Many people suggested just walking a show the first time to get a sense for it and I was led to believe (from one of the classes) that I could walk Surtex for free. So, I bought a really cheap plane ticket to NYC for the beginning of February! When I went to register to walk Surtex, I found that getting information about registration and pricing for the show was not easy. The website forced me to go through the whole registration process before I could see how much it would cost. To my surprise, it was going to be about $475 just to walk the show! That was steep, so I decided to hold off and do more research to see if there was another way. I used to work for a professional basketball team and had a boss that told me to never pay for a ticket to a sporting event, you can always find someone who can get you in for free! After reading several blog posts, including Shannon Mcnab’s, it sounded like sometimes exhibitors need help setting up and/or manning their booths. If they have an extra badge, they may be willing to give you one in exchange for your help. So I did a couple of things: 1. I joined some relevant groups on Facebook: Surface Pattern Design Community & Shannon McNab’s Creativity Clan and posted that I was looking for someone that needed help at their booth, and 2. I e-mailed Shannon to see if she had any advice on how to track someone down. Shannon was SO helpful. She sent me the list of exhibitors and told me which types of exhibitors would be most likely to need help (first time exhibitors in the art & brand licensing category). So I went down the list and sent out a handful of e-mails. I got two e-mails back, and one taker! Alyssa from Drawn to Ecology responded that she was going to be alone and could use some help. We chatted on the phone soon after that and set up a plan to meet on the first day of the show. I did have a couple of people respond to my offer. They didn’t need help as much as Alyssa did and wouldn’t be able to give me a badge (they had someone coming with them already), but I gave them my number in case they were in a pinch and needed someone to help. Helping at Alyssa’s booth was definitely the best case scenario, but if you end up paying to walk the show, I would still offer to help anyone that needs it. Often they just need to run to the bathroom, and would rather have someone at their booth than to leave it empty. I’ll talk about this in my next post, but these small contacts with other artists are so beneficial! When should you start reaching out? I started putting feelers out one month before the show, and had finalized plans with Alyssa about 3 weeks before the show. However, with 2-3 weeks left before the show I saw someone post in one of the Facebook groups that they were looking for help, and Shannon also posted that an artist had reached out to her looking for help. So it is never too late! There is so much to do to get ready for a show that I get the sense that many people are doing last minute prep and may have just convinced themselves that they can do it alone. In my next post I’ll share what my experience was like (hint: very good). Please feel free to comment or e-mail me if you have any questions that I didn’t address.